I bought my better half a toilet for Christmas. I know, that doesn't sound like a particularly good idea in general and, as it turned out, it wasn't. She did, however, very much want the toilet replaced. Of course when it came time to install the new toilet I couln't reconcile myself to the idea of putting a shiny new toilet on an old and unattractive vinyl floor. Ripping out the vinyl revealed 5/8 inch plywood rotted out around the toilet as well as a toilet flange that was completely rusted away. There were no shut off valves under the sink and the 3/8 supply lines were corroded almost completely shut. After 2 days of plumbing work I was ready to start on the floor. [caption id="" align="alignleft" width="221" caption="A note: We usually repair the walls and paint before installing the new flooring on remodeling projects and new construction. The joy of working on my own house is that I can torture myself by doing things out of order. 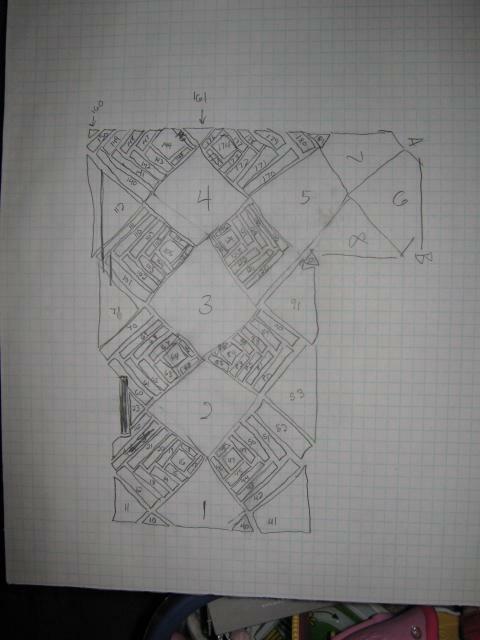 The benefit is that it reminds me why we do things in a certain order."] [/caption]I'm not going to get into how you determine if there is sufficient framing, sub-floor and underlayment beneath a floor for a tile installation, suffice it to say that in this case we had 2 x 10 joists @ 16 inches on center spanning 15.5 feet, 1 layer of 1x5 t&g subfloor topped with 1 layer of 5/8inch plywood. 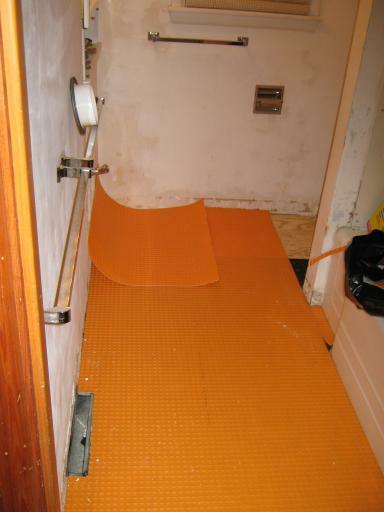 For a tile underlayment I chose Schluter Ditra. Unlike cement backer boards which have been rather popular for the last few decades Ditra is a flexible (it comes in rolls) molded plastic membrane bonded to a layer of felt. 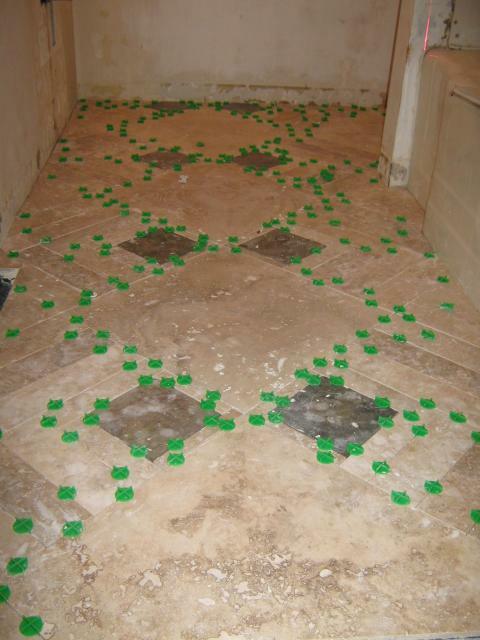 Besides being a superior performing uncoupling layer for a tile assembly it is very easy to work with since it can be cut with a knife or shears. 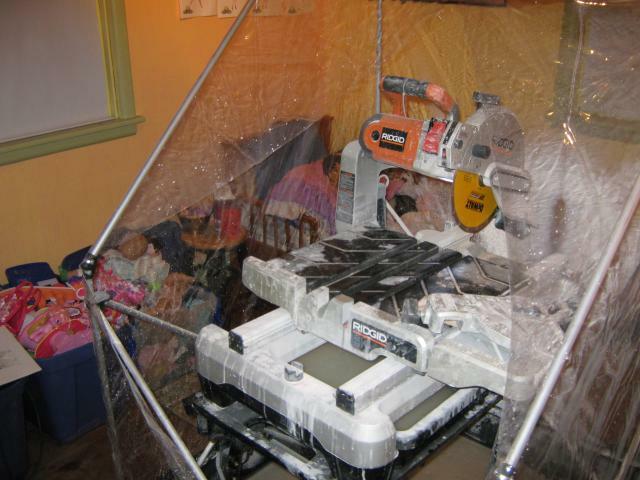 It is also a waterproof material and is approved for waterproof floor installations which is accomplished by putting an additional strip membrane over the seams and up the wall a few inches. The Ditra is just layed in loose to fit here, a layer of thinset will be spread on the subfloor and the felt side of the Ditra will be embedded into the thinset. 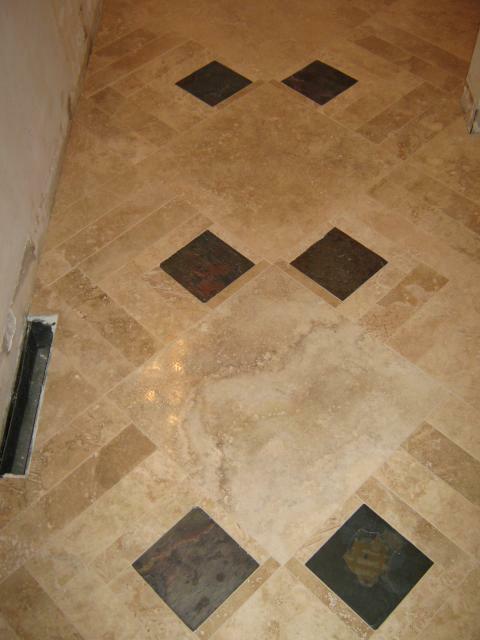 The final pattern was comprised of the 18 inch travertine and 6x6 slate for the accents. Around the slate I cut down pieces of travertine into one, two and three inch strips to form the modified herringbone pattern. As I began laying the tile I once again used the laser to keep the uncut travertine tiles aligned as I laid the other pieces in around them. Well, now that that is done all I have to do is repair the plaster walls and ceiling, prime, paint, install the toilet, build a new vanity, install a new vanity top and faucet, new towel rods and paper holder, rip out the tub surround and tile it...I better think this through the next time I buy Dani a plumbing fixture!